A wholesome treat for your skin! 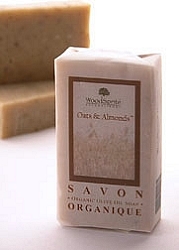 Combining the gentle cleansing power of organic oatmeal with the exfoliating properties of ground almonds, this deliciously scented (we dare you to not try and take a bite) soap leaves skin silky, soft and smooth. Ingredients: Saponified Oils of *Organic *Extra Virgin Olive, *Organic Coconut, *Organic Palm, *Organic Sweet Almond; *Organic Shea Butter; *Organic Oats, *Organic Almonds & Pure Essential Oils of Bitter Almond, Nutmeg, Allspice, Peru Balsam and Cassia. (*Certified Organic) Suitable for dry skin. 4 oz. wt. "I have Oats & Almonds soap in my shower, and I wash my face with it every night also - in just 5 days I feel such an amazing difference in my skin - softer and clearer - not to mention the delicious way my skin smells and feels all day..."